This segment of Apollo 13 Flown Armalon Seat Material measures 22mm x 20mm (sides) x 30 mm (bottom). 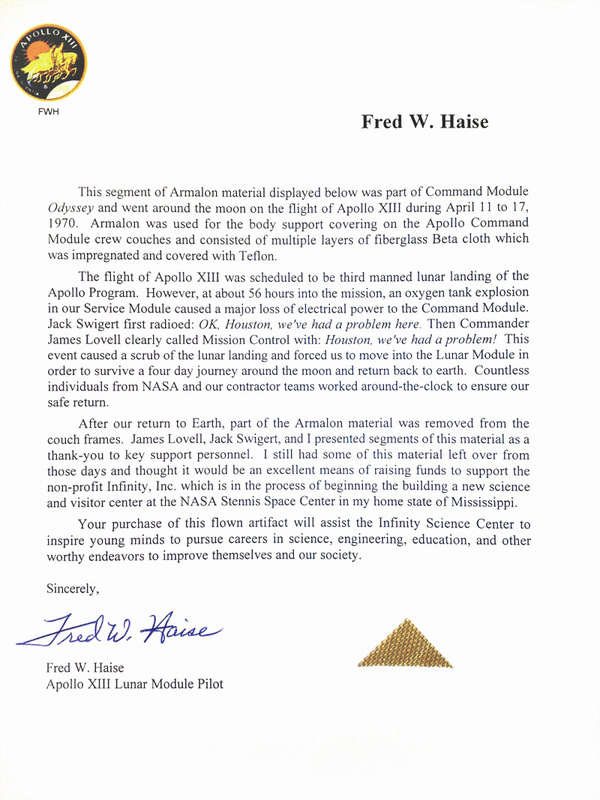 And has been affixed to a COA letter typed and signed by Apollo 13 Lunar Module Pilot, Fred Haise. As mentioned in the COA Armalon is made from 2 pieces of Beta Cloth impregnated with Teflon. The Apollo 13 crew had presented pieces of the material to	key support personel as a thank you for their part in the mission. Haise then decided to sell his remaining pieces to raise money for a non-profit organization for which this piece was originally purchased. (not applicable to this re-sale).